South of Lake Champlain, the New York-Vermont border blurs, with numerous roads looping through the two states. Cultural and economic distinctions also become less sharp as separations give way to connections. And cross-border physical unity is nowhere more obvious than in the Slate Valley, which straddles the state line as it runs 24 miles from Granville, N.Y., in the south to Fair Haven in the north. The heaps of waste slate that can be seen from Routes 22A and 31 provide visual evidence of a subterranean link that predates by eons the division drawn on maps. Curious travelers can find out how those mounds got there, and learn about the area's rich ethnic history, at the Slate Valley Museum in Granville. Housed partly in a relocated, 180-year-old Dutch-style barn, the museum presents exhibits on the geology of slate deposits, as well as on the equipment and workers in an industry that remains economically important to the six-mile-wide valley. Artworks are also on display. A permanent exhibit offers the work of locally renowned photographer Neil Rappaport, who recorded images of the quarries and the quarrymen over a 25-year period before his death in 1998. His documentation began by accident, Rappaport recounted in an introduction to a sampling of his photos. "My car broke down next to the Evans pit [in Fair Haven], from which the sounds of Italian opera could be clearly heard," he wrote. "Looking over the edge, I could see a lone rock man shoveling rubbish, the radio in his lunch bucket playing the Saturday afternoon opera from the Metropolitan. I knew I should photograph there." Rappaport's shots of quarrymen in bare-chested poses communicate the macho code of the slate operations, which still require "hard work, hard work, hard work," according to Shawn Camara, whose family owns 36 quarries in Vermont and New York. 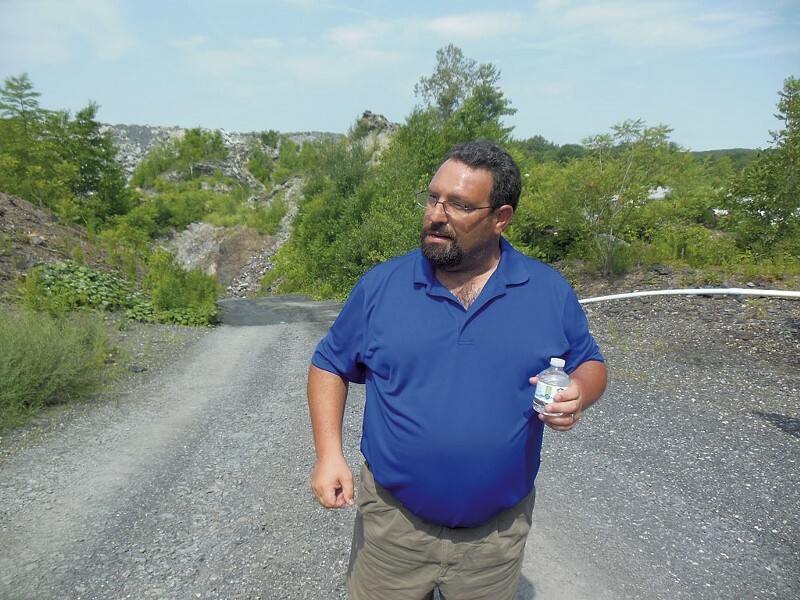 Camara — himself a burly, bearded bear of a man — led a museum-sponsored tour last Saturday of the Blissville quarry in Fair Haven. A mural transported to the Slate Valley Museum from Granville's town hall likewise depicts the symbiosis of muscular workers, their power tools and the hulking equipment used to lift, move and slice big blocks of rock. Martha Levy, a painter from Woodstock, N.Y., about whom little is known, created the roughly 30-foot-long mural in 1939 as part of a federal program that commissioned artists to execute public works during the Depression. Slate-related art is still being made today, as evidenced by another exhibit at the museum in Granville. "Slate as Muse," which remains on display through November 7, includes works by 19 artists, many from Vermont or New York, who depict or make use of the metamorphic material in various ways. While artists illustrate the story of slate, much of the museum, which was established in 1995, is given over to text-heavy panels that detail the ethnic aspects of the valley's 175-year-old industry. First came the Welsh. Already skilled in quarrying techniques, these immigrants began arriving in the valley soon after slate was found there in the late 1830s. The Welsh were eager to escape what the museum display describes as "the low pay, feudal nature and industrial strife" associated with slate extraction in North Wales. 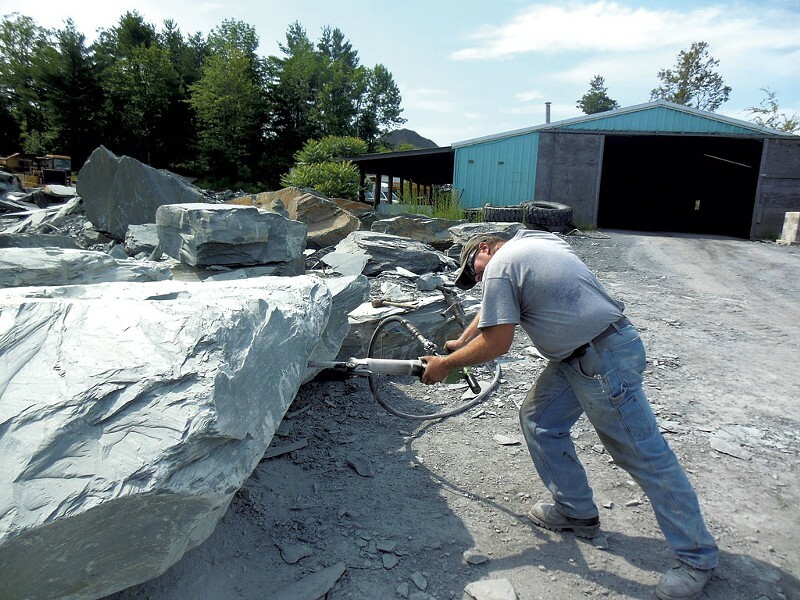 A Camara company worker jackhammering a block of slate at the Blissville quarry. Irish, Italians and eastern Europeans made their separate ways to the Slate Valley later in the 19th century. And they weren't always welcomed. A section of the exhibit devoted to Slovak and Polish quarry workers notes, "Their peculiar names, unfamiliar religion and foreign language were subject to suspicion and ridicule." At its peak around 1900, the local slate industry provided employment to nearly 1,000 Vermont and New York residents in more than 200 quarries. Today, about 300 workers — many from Mexico and Central America — open the earth to gouge out multi-ton hunks of slate that they then split and polish for eventual sale as roofing and flooring materials. Camara explained the process at length to about 50 sweating visitors during the two-hour, midday tour last Saturday. He tapped into a lode of facts about slate, noting, for example, that the moisture-laden rock is easy to split early in the morning, more difficult in the afternoon and altogether impossible after six weeks of exposure to the air. Temperatures of less than 10 degrees Fahrenheit likewise render the rocks forever impervious to a splitter's efforts, Camara informed his guests. He related the background of his company, which traces its origins to Camara's father's 1953 sale of Fair Haven slate to buyers in Worcester, Mass. The industry's intensely ethnic character was highlighted, the younger Camara recounted, when his father was advised early on to present himself to potential customers as Italian rather than as Portuguese, his actual heritage. Camara Slate Products has prospered, its co-owner said, despite daunting price competition in the past 20 years from operations in China and Brazil. A flooring panel that the Chinese sell for 40 cents costs $3 when purchased from a U.S. quarrying firm, Camara noted. Yet his family's own annual sales have grown from $2 million to $13 million during the past two decades. He attributed that success to diligence in both the quarries and the administrative office, as well as to the quality and colors of the slate pried from pits in Vermont and New York. Nowhere else in the world can slate be found in so diverse an array of greens, grays, blacks and reds, Camara said. A potential market also exists for some of the waste slate piled around the Blissville property. Camara said he got turned on to this possibility by a local organic gardener who visited the quarry in hopes of buying slate shards. "What would you want that for?" he asked her. "She told me she mixed it into the soil to keep away pests. Slate's microscopically sharp," Camara explained, "so it cuts the bugs' mouths and makes it so they can't eat. They leave those gardens alone." Local slate, which can keep a roof sealed for 100 years or longer, is also more durable than anything the Chinese or Brazilians can produce, he told the tour group. The 180-year history of slate mining in New York and Vermont offers a fundamental advantage over more recently established industries in other countries, Camara added. "We've got a deep understanding of what makes good or bad slate," he said. "Newer operations — they just don't have that kind of history behind them." The original print version of this article was headlined "Working Geology"